Ada Lovelace was born in 1815, so this is the 200th anniversary of her birth. When she grew upon, she was one of the few people – possibly the only person – to fully understand the possibilities of Babbage's Analytical Engine. Indeed, she is credited with writing what was, in effect, the first computer program. Unfortunately, Ada Lovelace died young, at the age of 36, and Charles Babbage never built his Analytical Engine. 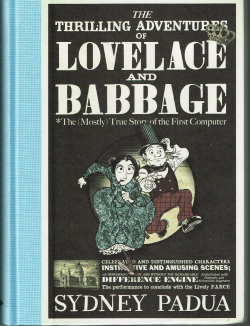 Had Lovelace lived, and had Babbage actually built his invention, the computer would have been invented a hundred years before it was. That's where it ended – in this universe. Using the age-old sci-fi trick of positing multiple alternate realities, Padua imagines what might have happened had things turned out differently. This is all done through the medium of a graphic novel, and plenty of humour.